The little baby’s name is Nevaeh – Heaven spelled backward. 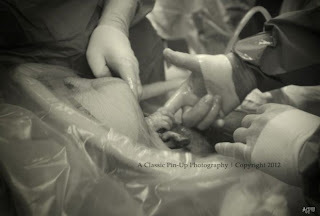 Even the hospital staff told her parents there's something almost spiritual about the picture of Nevaeh holding the doctor's finger before technically being born. “It was such an amazing photo. [Hospital staff] had possibly heard of it happening but they had never seen a photo of it,” said Alicia Atkins, Nevaeh’s mother. Few lives will be as well documented as little Nevaeh's. Her mother is a professional photographer who owns A Classic Pin-Up in Glendale. However, it was her dad, Randy, who snapped the picture. “The doctor called me over and said, ‘Hey, she's grabbing my finger.’ So I ran over there and just grabbed the shot and I was just in awe looking at it. It was such an amazing picture,” said Randy Atkins, adding that he was nervous about missing the precious and fleeting moment as he hurried to snap a picture.